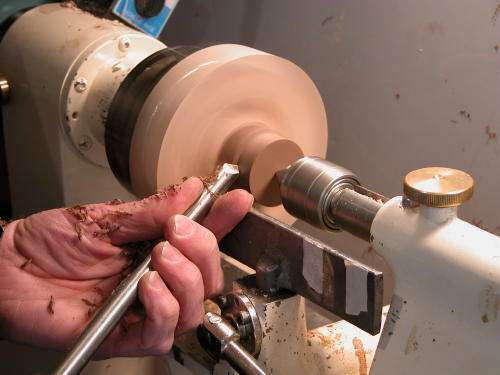 This article was published in the Spring 2005 edition of Woodturning Design. One of the nice things about being a woodturner is that you can inexpensively substitute handmade items for some of the mass produced plastic artifacts in your life. This article describes how to make a refrigerator towel hook. It has simple but elegant lines, performs its function well, and makes an easy introduction to multi-center woodturning. 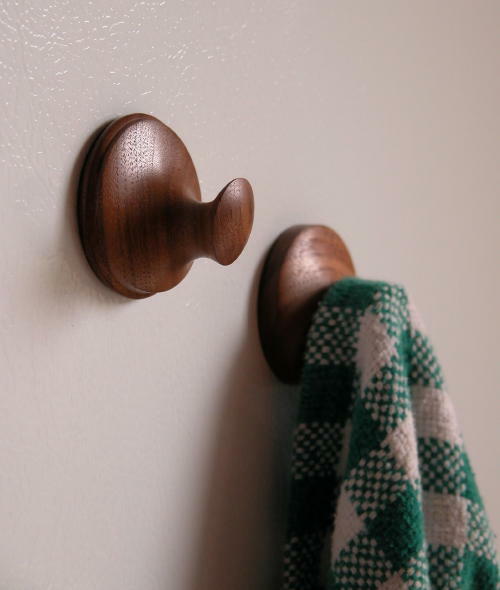 Other than being big enough to hold a towel, there are no traditionally prescribed dimensions for towel hooks. Other than selecting stock that’s wider than the magnets you plan to use, you can let the convenience of using what stock you have determine the dimensions. As I had some Walnut left over from another project that was 1 ¼” thick and 1 ¾” wide, I took the path of least work and simple cross-cut several 1 ¾” squares. This is a learning experience, cut more than you plan to make. The next step is making a recess for the magnet. Unless you’re planning to produce mass quantities, the slight additional cost for 1” magnets pales in comparison to putting up with a wimpy towel hook. You may wish to invest a few more pennies in some high-friction disks to prevent the tendency of even the strongest magnets to slide down. I used a 1” Forstner bit to make the recess for the magnet. Next to magnet strength, accuracy of the recess is most important in determining holding power. If the recess is too shallow, the magnet will protrude and the hook will look funny. If the recess is too deep, the magnet will not be in contact with the refrigerator and will have a considerably weakened hold. Particularly with Forstner bits, using a drill press with the stock clamped in place is the best way to make repeatable accuracy easy. I used a cross-slide vise to hold the stock, registering the stock against the corner of the vise so I didn’t need to recenter for each piece, but however you clamp the stock will be fine. As long as you do clamp—not only is it more accurate, but easier on your fingers. I centered my stock under the drill bit and brought the drill bit down so that the rim touched. To set the depth roughly I put a magnet on top of the quill stop and bought the stop nut down until it touched the magnet, then removed the magnet. Then I drilled the recess. To check the I dropped a magnet in place. If your Forstner bit yields a loose fit you can easily remove the magnet from the recess by laying a large steel object, such as a screw driver, on top of the magnet. If your bit yields a snug fit you may have to pry it out. Any marks will probably be covered up by the high friction disk, or you can simply throw the trial piece away. A way to avoid this problem is to make a Test Fit Magnet. Take a piece of scrap wood and glue it to a magnet with super glue. This gives it a handle you can use to remove the magnet. I made the required depth adjustments (my recess was too shallow, the rim cuts a trifle deeper than the bulk of the drill), rechecked the depth, and then drilled the rest of the blanks. Using a 1” Forstner bit to drill the recess for the magnet. Checking the recess depth. It’s not quite deep enough yet. 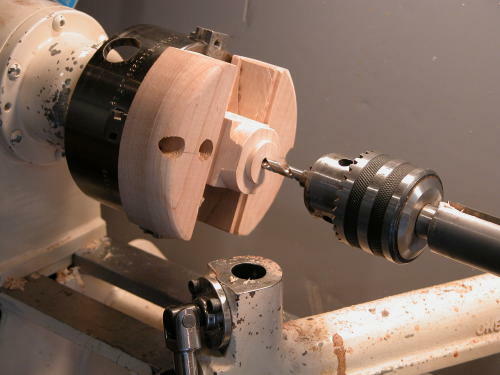 If you don’t have a drill press, or don’t wish to use it, you can easily drill or turn the recess on the lathe. Just center the Towel Hook blank in the Two Jaw Chuck and then either drill the recess with a Forstner Bit mounted in your drill chuck, or turn the recess with a scraper. 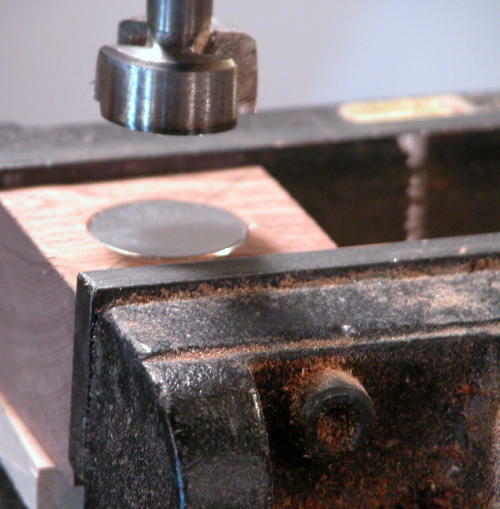 You won’t have an automatic depth stop like on a drill press, so it would make the frequent checking more easy if you make a Test Fit Magnet as described above. The Towel Hook blank will be held in the Two Jaw Chuck using a block of hardwood that has a tenon that matches the magnet recess. The exact width of the block doesn’t matter, as long as it’s wide enough to stably support the Towel Hook blank, and not so wide that the jaws are opened too far. I used maple cut to 1 ½” square. It does matter, when it comes to gripping securely, that the sides are straight, smooth and parallel. This is easier to obtain on a table saw. The exact depth of the blank is non-critical also. Obviously it needs to be deeper than the depth of the lower step in the Two Jaw Chuck—other than that it’s nice that it stick out far enough to keep fingers and tools away from the Jaws, but not so far as to add vibration problems. My block was 2” deep. I marked the center of the block and used the tail stock to help center it in the Two Jaw Chuck. I left the tail stock engaged to help make sure the Glue Chuck didn’t shift during turning. First I used a bowl gouge to take the corners off most of the area of the glue Chuck that protruded from the Two Jaw Chuck and flattened and trued the face. Then I used the bowl gouge and a parting tool as a scraper to turn a tenon that matched the magnet recess drilled in the Towel Hook blank. Test the fit often. Both the diameter and the depth are important. You don’t want a jam fit, but want it to slide on easily but without slop. Don’t give the Towel Hook a whack if the fit seems close but tight. If you do it will be difficult to remove the blank without shifting the Glue Chuck in the Two Jaw Chuck. Using the tailstock as a centering guide, I’ve mounted the Glue Chuck blank in the Two Jaw Chuck. After I was satisfied with the fit of the tenon I replaced the tailstock with a Jacobs chuck holding a ¼” drill bit, and drilled a hole through the center of the Glue Chuck. This serves as both a re-centering aid and knockout rod access for the removal of stubborn finished Towel Hooks. 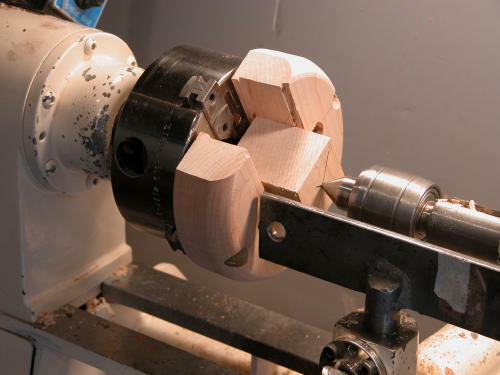 Drilling a hole for a knock out rod in the Glue Chuck. You can secure the Towel Hook blank to the Glue Chuck in several ways. You could use a paper disc and wood glue to make a paper joint. It would be difficult to remove the residue at the bottom before attaching the magnet, however. You could also use double sided tape. This cleans up easily, but requires a VERY accurate tenon size for a secure hold. The easiest method is probably hot-melt glue. Hot-melt glue holds securely enough for all but the most severe catches on this size turning, and is forgiving of minor inaccuracies in tenon size. The only drawback is that unequal thickness of glue may yield a slightly offset mounting. This will likely be invisible after the Towel Hook is finished, but if you’re so compelled, then you can probably prevent this by using a heat gun (or hair dryer) and a small metal implement to spread the glue evenly before attaching. 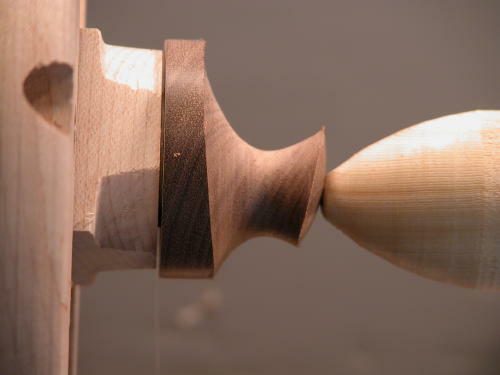 To start the first turning of the Towel Hook, I first centered the Glue Chuck in the Two Jaw Chuck, and marked one corner of the chuck with a pencil and its position against a jaw. 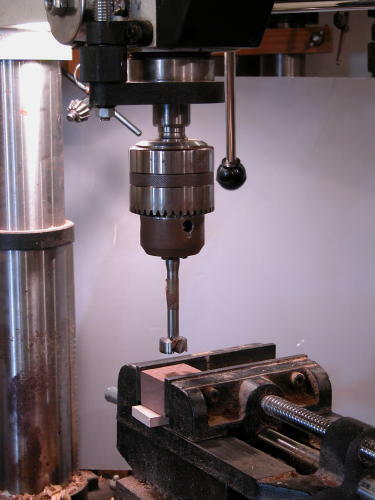 To prevent the chuck shifting in the jaws while roughing down I engaged the tailstock lightly. I used a small bowl gouge to first turn the Towel Hook blank round, and then to a dome shape. At this point I withdrew the tailstock and turned away the dimple it left. To reduce sanding time I used a shear scraper to smooth the surface further. Then I sanded with progressively finer grits until I was satisfied with the surface. The Towel Hook blank mounted and ready to begin turning. Here I’m using a wood tailstock nose extension to help secure the blank. 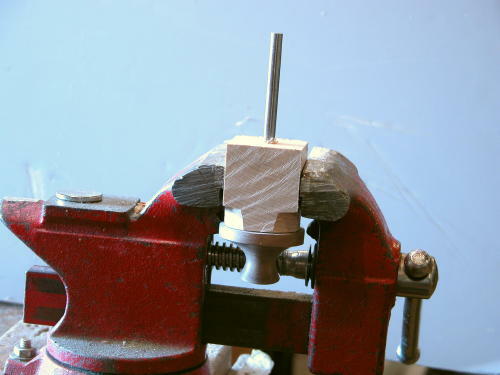 Using a bowl gouge to round the Towel Hook blank. This is an earlier picture than the others; you can see that I’m using the tailstock instead of a soft nose to steady the blank, the Glue Chuck has a shorter nose, and that I haven’t rounded the corners on the Two Jaw Chuck yet. The Towel Hook blank after the first turning is completed. You may be wondering what the masking tape is doing on the tool rest. At this point, writing the captions, so am I. Probably left over from a different project. 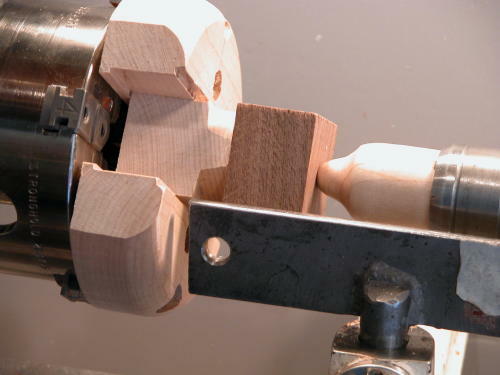 To produce the hook shape the Glue Chuck needs to be shifted in the Two Jaw Chuck. It doesn’t need to be moved much—¼” is more than enough. I moved the Glue Chuck over and marked the new location referencing the same corner. Whether or not to try to stabilize the blank with the tailstock is a decision you’ll have to make. 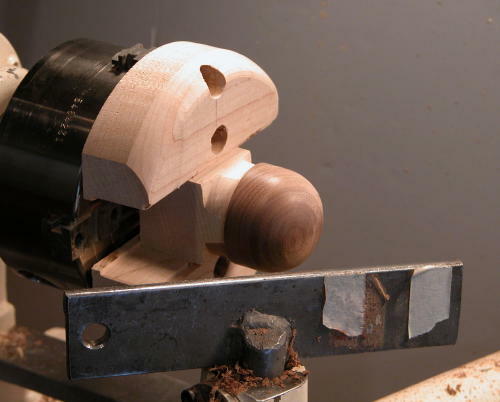 If you don’t use the tailstock, the slightest catch may ruin the work, and catches are more likely in the beginning when you’re turning as much air as wood. On the other hand, using the tailstock, even lightly, will leave a defect that will have to be hand sanded out after removing from the lathe. You can decrease the marring by either making a soft nose out of pine that fits on the tailstock, or by using hot-melt glue to fasten a scrap pad which the tailstock can engage to the Towel Hook blank. 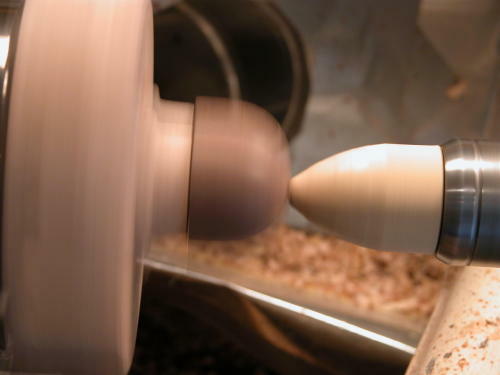 I started the lathe very slowly and increased the speed until I reached a comfortable speed for cutting or encountered excessive vibration. I double checked the amount I moved the chuck by looking for a solid core within the ghost edges of the turning Towel Blank. Next I used a small bowl gouge with a ground back profile to cut the equivalent of a cove shape. Getting the best surface requires cutting from the bottom of the cove outwards, but this would be hard to do initially. I started with light cuts from the edges of the “cove” until I was close to the shape I wanted (stopping the lathe may help you evaluate the shape better). Then I switched to a rounded shear scraper and cut in the “correct” direction. Last I sanded with progressively finer grits. Checking to make sure they’ll be sufficient solid core and not all ghost after off-setting the Towel Hook blank. The Towel Hook after the second turning. To prepare for finishing I took the Towel Hook and Glue Chuck out of the Two Jaw Chuck and removed the hook from the chuck. You may be able to remove the hook by applying steady pressure. If not you can pry it off, being careful not to mar the side of the Towel Hook. If the hook is stubbornly attached, clamp the Glue Chuck in a vise and tap a knock out rod with a mallet to break the glue joint. After removal, I cleaned up the residual hot melt glue by “rolling” it out with my fingers. Using a metal rod to knock a stubborn Towel Hook off the Glue Chuck. I applied a friction polish (shellac/linseed oil/alcohol) with a rag, first starting with a fair amount of finish on the rag moving slowly, then with less finish and quicker movement to attain a semi-gloss. I tried to stay out of the recess. For the last step I spread some thick super glue in the recess and pressed in the magnet. I gave the finish and the glue some time to cure before taking it upstairs. Two finished Towel Hooks in use on my refrigerator. *Rare Earth Magnets are available from Lee Valley ; 1-800-871-8158; PO Box 1780 , Ogdensburg , NY 13669-6780 ; www.leevalley.com.